On this trip Matt will be hunting Moose & Black Bear with Longbow and Charlie Rehor is filming. Charlie will be the Live Hunt Host and bringing you the updates. Hunting the bogs of Newfoundland with stick and string (while trying to video) will be quite a challenge. Their hunt started with a 15 hour drive from Rhode Island to North Sydney, Nova Scotia where they boarded a ferry to Newfoundland. When they arrived in Newfoundland they then drove another 4 hours to camp. Driving allows them to take all their gear in the truck and if successful, the meat, cape and rack can return with them. We will be hunting with Cog Pelley, White Feather Lodge.Â This is the same Bowsite Sponsor I hunted with in 2010 and again last year with Tom Edgington, aka “Mad Trapper”. We arrived at Cog’s place late Saturday where he has a beautiful lodge right on a pond! Hunting begins on Monday. We started the morning driving north from camp with our guide Nelson. We then crossed two streams by foot to where he had previously positioned his quad. Crossing small streams in the dark is so much fun! LOL! Matt and I then sat on each side of the quads rear wheels with Nelson driving and fought the overgrown alder branches on the old trail for about an hour until we got to where Nelson wanted to begin hunting. 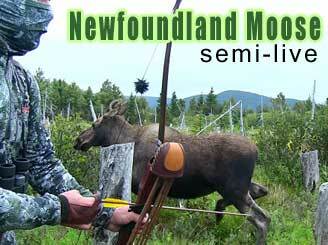 The key to bow hunting Moose in Newfoundland is getting to areas where others won’t go. We NEVER saw another hunter on this hunt. The locals and most Guides will not go far from roads but if you want to hunt Moose with bow effectively on this Island you must hike in and be willing to walk a lot. The three of us were not 200 yards from the quad when we busted a Moose. Nelson did a bull grunt call and he answered. During the next ten minutes we waited and called and could hear the bull in deep timber circling downwind of us about 70 yards. Matt was scrambling to get ready and I was fumbling around with the video camera. This calling sequence did not work out but served to get us super ready. When we got to the first ridge to glass we immediately spotted a cow moose and two bulls. One bull looked to be a shooter so we did a big loop to get downwind but when we crested the ridge we could not find the moose. We figured they had bedded down so Nelson told us where to set up and circled around to do a slow push on the bedded moose. After about 10 minutes we heard two moose go by us about 60 yards away but could not see them. A few minutes later a cow moose came by us at 4 yards. When you watch the video you will see that Matt stayed focused as the moose went by because he thought the bull could be following. The hair on the back of this moose is up and so was ours! LOL! Talk about pumped up! A few hours later we crested another ridge and spotted a really big bear eating blueberries. It looked like we would get a stalk but then we saw two cubs. As it turned out this was a huge sow. We spent the rest of the day hiking and glassing. We saw 12 Moose (7 bulls) and four bears today.